According to an Australian Electoral Commission (AEC) tweet, between August 8 and 22 the electoral roll increased by 54,545. There were 577,879 total enrolment transactions processed in that time, including checking and updating enrolment details. This data does not include the last two days of the enrolment period, which closed at midnight on August 24, so these numbers are likely to increase. Student groups nation-wide registered their opposition to the government’s proposals to raise student fees and lower the HECS threshold at an action in Canberra on budget day on May 9. The $2.8 billion in cuts would see fees increase by a maximum of $3600 for a four-year course with students paying for 46% of the cost of their degree on average — up from 42%. The cuts propose a lowering of the HECS threshold — down from $55,874 to $42,000. Tertiary students are doing it tough. Yet the Coalition would have you believe we have it easy. High — and getting higher — course fees, job insecurity and accommodation costs are all adding to students’ anxieties. A student action against education cuts was held at the University of Sydney on May 20. It was organised by the National Union of Students. Greens Senator Lee Rhiannon talked about the fantastic campaign in Chile for free education and how students here should take inspiration from the mass campaign there that made it happen. Photo: Pip Hinman. 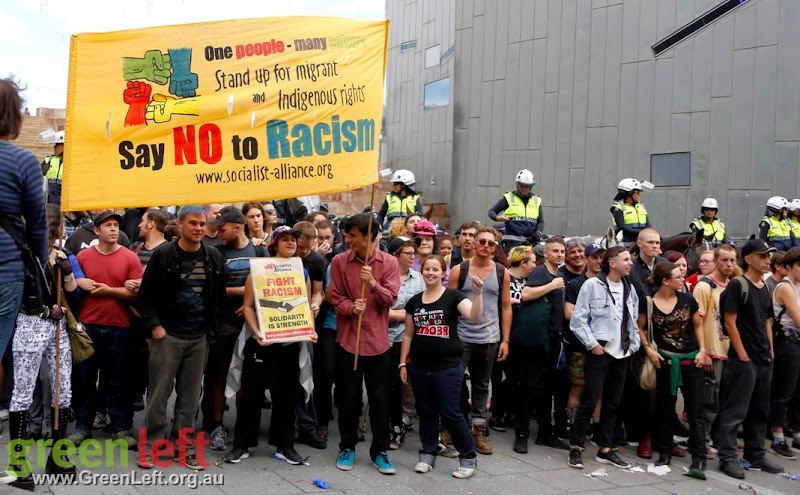 Two thousand people rallied in Federation Square on April 4 to oppose Reclaim Australia freely spreading racism and fascism on the streets of Melbourne. Anti-racist participants included socialists, anarchists, feminists, refugee rights advocates, Aboriginal and Torres Strait Islander people, and the politically unaligned. All were united in a common cause to stop the spread of racism in Australia. On March 25 university students and supporters of accessible education participated in National Day of Action rallies against the ongoing attacks on education. There were rallies in Adelaide, Brisbane, Canberra, Melbourne, Perth, Sydney, Tasmania and Wollongong.